The Social Services Network in partnership with the Durham Regional Police Services, the University Of Ontario Institute Of Technology, Durham College, York Region Children’s Aid Society held a successful media launch on October 18th at the Durham College. The objective of the launch was to share the recommendations and report findings of the Impact of Family Violence: A South Asian Perspective Conference 2013 and launch the date of the 4th Provincial Impact of Family Violence Conference in Durham Region. 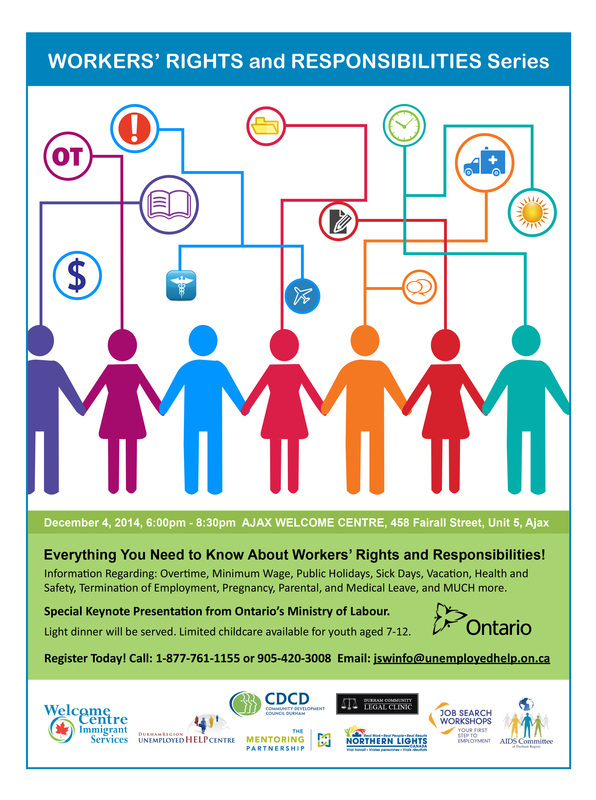 The report produced by Social Services Network in collaboration with Sheridan College outlines the collective experiences and opinions of the hundreds of conference participants including service providers, community members and policy makers who attended the conference held at Sheridan College in May this year. Violence against women in Canadian society is a reality in both the majority and minority cultural groups, across income levels and regions. Unequal power relations are at the core of violence against women, children, youth and seniors. The Impact of Family Violence Conference is five year Initiative led by the Social Services Network and partners to understand the specific nature, systems and complex cultural and family dynamics that pose barriers and challenges to preventing and responding to the abuse that is occurring in South Asian families. Our partners supporting and guiding us in this endeavour are Durham Regional Police Services, Peel Regional Police Services, York Regional Police, Toronto Police Services, Community Mobilization Unit, Durham Tamil Association, Women's Multicultural Resource and Counselling Centre of Durham, Community Development Council Durham (CDCD), Muslim Welfare Home, Victim Services of Durham, Durham Elder Abuse Network (DEAN), Durham District School Board, Outreach Services at Durham College and University of Ontario Institute of Technology, York and Durham Region Children’s Aid Societies, Durham College, as well as University of Ontario Institute of Technology. There were over 50 supporters in attendance from organizations such as Aids Committee Durham, Bethesda House, Canadian Council of Muslim Women, CDCD, Corner Comforts, DRPS, Durham Children’s Aid Society, Durham College, Durham Tamil Association, Friends Indeed-Durham, Luke’s Place, Muslim Welfare Home, Peel Regional Police, Punjabi Community Health Services, Social Services Network, Toronto Police Services, University of Ontario Institute of Technology, Victim Witness Assistance Program, White Ribbon Campaign, WMRCC of Durham, York Children’s Aid Society, and York Regional Police Services and media partners CBC, ATN, and Tamil One TV. Durham Tamil Association was invited to be part of the FVC and it was a honour for Mrs. Uma Suresh to join the steering committee, representing both DTA and WMRCC . Being one of the major partners of the Family Violence Conference, Durham Tamil Association contributed to the Family Violence Conference and the media launch in many ways. DTA connected various community groups of Durham to SSN, invited Durham District School Board to be one of the major partner of the conference, invited various media of South Asian communities and currently involved in creating the dialogue about the conference among different ethnic groups and promoting the conference among the youth through Durham District School Board. The 4th Impact of Family Violence Conference: A South Asian Perspective, will be held on May 14th and 15th of 2014 in Durham College and the University of Ontario Institute for Technology. Durham Tamil Association celebrated it’s 13th Annual Youth Festival on Saturday November 15th in Pickering High School.The Masters of the Ceremony were Vaishnavee Muraleetharan,Ashley Kugaraj, Divijj Kumar.This year’s festival was dedicated to raise money funds for Sivananda Thapovanam in Thirukudalur,Trincomalee, Sri Lanka.This edition of our Youth Festival featured over 160 performers.The show was all about expression and our focus was to help these children to express themselves regardless of their talent level. The event commenced with the Canadian National Anthem, followed by the Tamil Anthem. The chief guest of the evening was the Hon. Chris Alexander, P.C. Canada’s Citizenship and Immigration Minister. The program commenced with the Lighting of the Lamp by Hon. Minister Chris Alexander,Deputy Mayor of Whitby Don Mitchell,Councilor of Pickering David Pickles and Councilor of Ajax Joanne Dies. 10 Outstanding Youth Volunteers Anittha Srisuresh,Arabi Sriranjan, Archana Thurairajah, Jesihan Ravichandran, Luxsiya Kanthavanam,Melani Vijayakumar,Nithiyasri Pirithiviraja, Peeraveena Sivakumaran, Sanoch Sasiharan and Thusyanthi Balasubramaniam along with 3 Adult Volunteers Mrs.Deepa Sivasangar, Jailani Basha and Karun Joshua were recognized by Hon. Chris Alexander, for their contribution to the community. MP Corneliu Chisu recognized 19 selfless teachers Mrs. Thulasi Ragunanthan, Mrs.Varnapriya Murugiah, Ms.Anna-Maria Theofilopoulos, Mrs.Sujee Nissankan, Mrs.Manorani Thusitharan,Mrs.Banu Kandiah, Mrs. Kalaimathy Vageesan, Jailani Basha,Mrs. Shiyama Thayaalan,Karun Joshua,Mrs. Deepa Sivasangar, Jeremy Francis, Abishna Jayasundararajah, Tharmela Ganendralingam,Mrs.Uma Suresh,Mr.Thayalan Gobalakrishnan,Mrs.Ajantha Satkunam,Ms.Vaishnave Muraleetharan and Mrs.Yokenthera Kalaichchelvan with scrolls for their hard work in making this Youth Festival a successful event.These scrolls were presented by Mrs. Shashi Bhatia,Chairperson of ICCAD. MPP Joe Dickson recognized 10 outstanding parent volunteers Mrs.Karthyka Jokarasa,Mr.Thayalan Gobalakrishnan,Mrs.Yokenthera Kalaichchelvan,Mrs.Norin Francis,Mr.Manorathan Pancharatnam,Mr.Jeyabalasingham Sellathurai,Mr.Manickavasagar Thanahanthan,Mrs.Kalaivany Pirithiviraja,Mrs.Sithira Vijayakumar and Mr.Saravanane Parasouramane for their contribution to DTA Programs and Initiatives. High School Graduates Abbinash Jeeva Shanmugam,Abishek Ravi,Aresh Srisuresh,Kabithan Ravichandran, Maenusha Raguvarnan and Peeraveena Sivakumaran were honored with gift cards, which was sponsored by President Josh Suresh.This was presented by Chris Braney, Vice Chairperson Trustee Pickering for DDSB. Josh Suresh,President of Durham Tamil Association recognized Whitby Councilor Lorne Coe,Kathy Williams-Director of Public Services for the Pickering Library,Donna Bright-Chief Librarian for the Ajax Public Library,Superintendents Luigia Ayotte and Camille Taylor of DDSB,Esther Enyolu-Executive Director of WWMRCC of Durham,Evelyn Poliarco-President of Filipino Canadian Heritage& Resource of Durham,Vaqar Raees-President of Friends Indeed,Cordelia McIntosh-President of Congress of Black Women of Canada,Kiruba Thuraiappa from Brampton Tamil Association,Shawn Binda-Chairperson of Devi Mandir and Shireen Whitmore from JAM Fest who were in attendance to grace the occasion. A slide show was presented by Saranya Suresh which showcased the experiences of our Youth Volunteers who participated in over 35 community events this year. This enabled the guest to understand DTA’s strength, passion and depth of our commitment towards Durham Community.Vote of thanks was given by the Secretary of DTA, Mano Pancharathnam. The four hour, fun filled entertainment by our children and youth came to an end with the Trophy Presentation by our strong sponsors. Heartfelt thanks to Suresh Thurairaja of Century 21,Suren Navaratnarajah of Allstate Insurance,CTBC Radio, Kumar Subramaniam of Century 21,Nitin Thorve of Allstate Insurance, Thayalan Gobalakrishnan of Mortgage Alliance, Dr. Paul Joseph, Archanas & co. ,The Spice King Takeout & Catering and Archanas Photography & Video for their strong support and contribution. We truly appreciate the various media including Snapd, CMR Radio, TVI, CTBC, EKuruvi, Nallayan.com, Monsoon Journal,Tamil Biztha and Artlink Multimedia for their continued support. We will continue accepting donations for Sivananda Thapovanam until our Thai Pongal Festival in January 2015.CD version of the Youth Festival is available for a donation of $5.All proceeds will be donated to Sivananda Thapovanam. 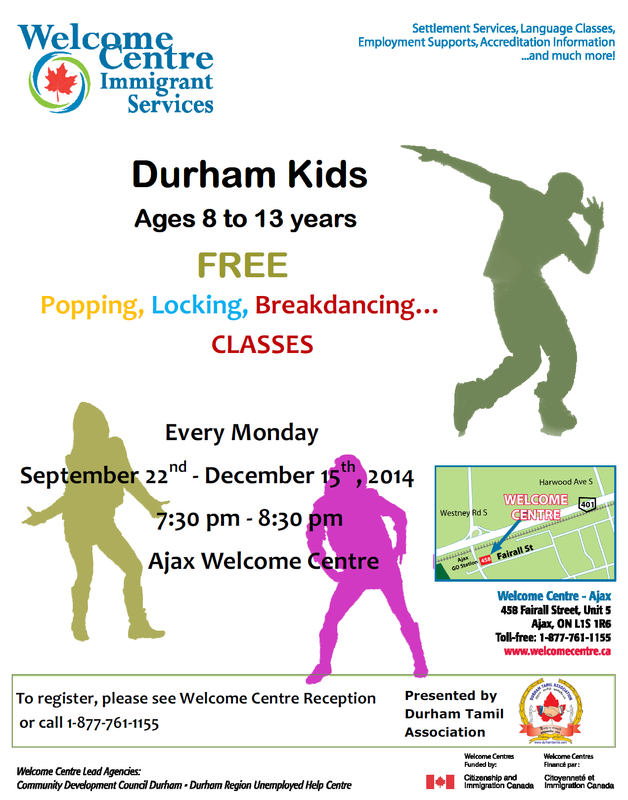 For more information, please contact Kanga at 905-428-7007/647-993-4937. 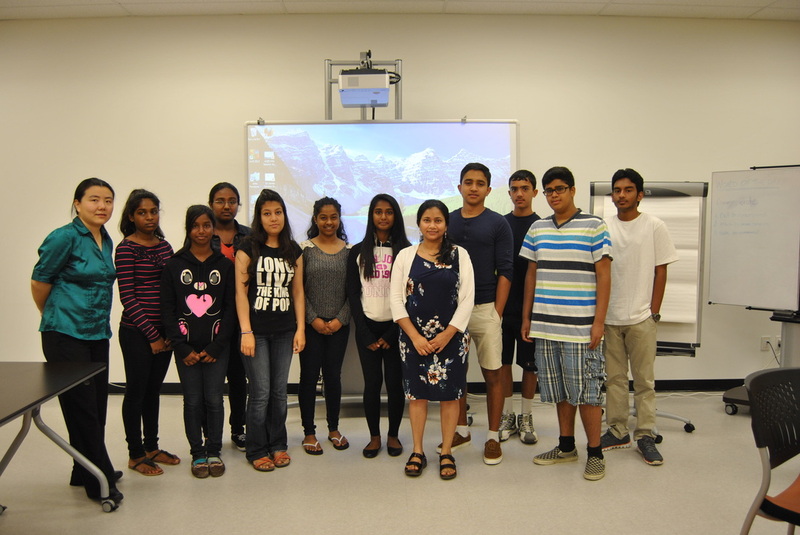 Durham Tamil Association Youth took part in the Youth Leadership Training program for the second year. This program help the youth to improve their communication skills and leadership qualities and this program was conducted by CDCD in Ajax Welcome Centre on July 3rd and 9th. occasion. Thanks to Town of Ajax and the Ajax Main Library for giving our children the opportunity to Travel the Silk Road. ordinary performance by singing the popular number Minsaara Poove from Padayappa. She was accompanied by DTA's iconic dancer Ms. Maenusha Raguvarnan who made an extra ordinary performance. DTA's younger performer of the day was Ms. Maanusha Vijayakumar who stole the audience with her energetic Folk performance. 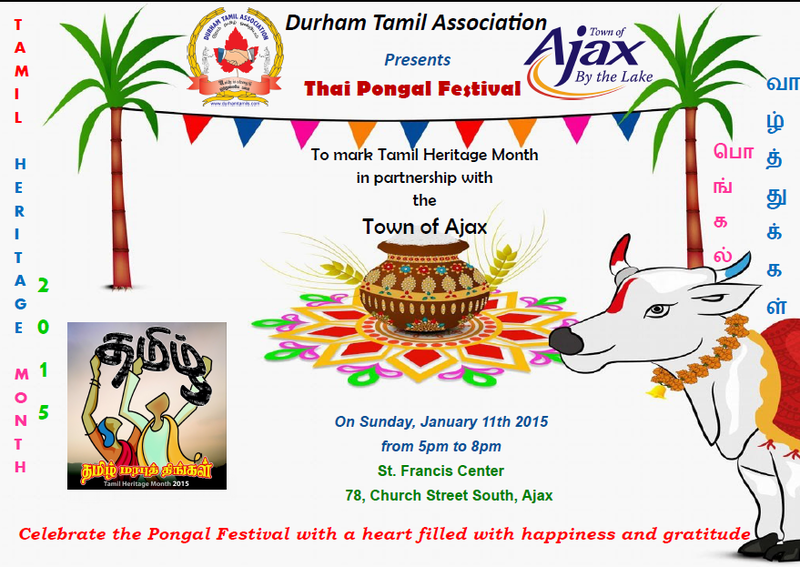 About 40 members of DTA took part and enjoyed this cultural event. Durham Tamil Association proudly took part in the Blood Donation Campaign organized by the Canadian Blood Services exclusively for the Organization. This camp ran in Pickering Recreation Complex on Friday April 26th from 3 pm to 7.30 pm. Many members of Durham Tamil Association volunteered to donate blood to save many lives. It was quiet a happy moment to see many first time donors expressing their willingness to donate blood in the future and registering to become regular donors. Blood.... It's in you to give!